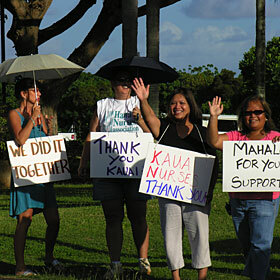 18 WEEKS LATER » Kauai nurses stood outside Wilcox Hospital yesterday afternoon to thank the Kauai community for its support during their 126-day strike. The survey by a team of specialists follows FEMA guidelines for the Oct. 15 quakes. The state envisions the development of a 200-unit building. Actor Ken Watanabe has plenty of star power. The book includes more than 300 color photographs tracing the development of Hawaiian style. The Idaho coach has won two national titles but has lost both times he has coached here. The Wahine hope the win over Idaho starts a new streak. The agreement is similar to ones reached with Hilton and Sheraton hotels in Waikiki. The property went on the market only seven months ago and drew 15 purchase offers. One of every 25 homes on the Big Island was damaged by the Oct. 15 earthquakes.